This is Kidlet's last week of school before Spring Break! Wooo! We're going to be doing a fantastic road trip to Boston with my dad to meet up with some family! 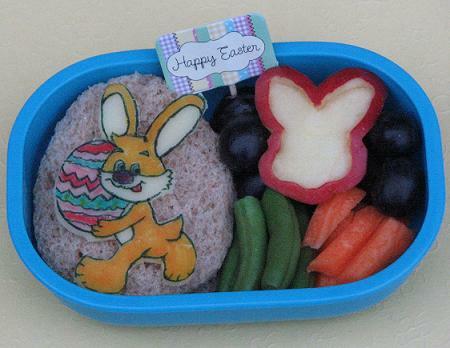 yay!So, since Kidlet won't be having bento the week of Easter, I am doing his festive holiday bento this week! I wish there was a way to meet up with you in Boston. I bet my oldest would accompany me in to the city for a few hours. It's been forever since I've been bento shopping locally! Yay! Our last week is this week too. Have a great time in Boston! Love your bunny! Perfect Easter bunny! Have fun with your family! Is Kidlet's leg getting better?